Our ERP solutions are designed for midsize companies or fast-growing small businesses with between 20 and +2,500 employees that are looking for a comprehensive, integrated industry solution to power their business activities. The software comes with built-in support for industry best practices as well as business intelligence functionality. Our ERP solution from SAP helps companies manage everything from financials, human resources, procurement, inventory, manufacturing, logistics, product development, sales, and marketing – all in a single, configurable solution. Our deployment tools and methodologies help achieve a fast and predictable implementation, with low risk, low cost, and rapid time to value. Midsize companies with industry-specific requirements can buy SAP ERP solutions from NBTeam. Customers can deploy SAP ERP on-premise or hosted. If you choose to host your SAP solution, the software is operated, maintained, and monitored by experts in an external data center. You won’t have any maintenance and update work – or any upfront capital investment. 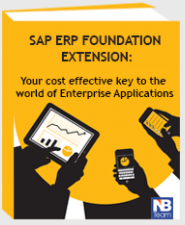 Sharpen your competitive edge and drive growth with enterprise resource planning from SAP!